This vast landscape encompasses the former areas known as Caithness, Sutherland and Ross & Cromarty. It covers 5,200 square miles (13,500km2) and had a population of just over 87,000 in 2001. The main inhabitated areas are Easter Ross and Caithness. This is an area of natural contrasts, caused for the most part by its complex geology. Much of Easter Ross and the Black Isle is fertile farmland, mostly given over to cereals. 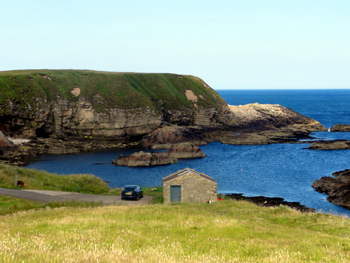 To the north, Caithness is gentle, rolling green and fertile cattle grazing country. The north and west coasts are rugged with many inlets and are backed by high mountains. Here, crofting, fishing and forestry are predominant with small, scattered settlements. Inland the population is sparse although this was not always so. The empty glens of Kildonan, Strath Halladale and Strathnaver are testament to what we would now call economic development – and what was then known as the ‘Clearances’. The many attractive beaches are varied, with everything from tiny coves to vast expanses of sand. In places they are backed by extensive sand dunes and machair. 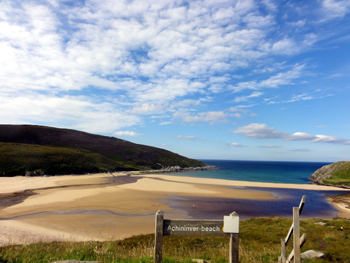 Oldshoremore, Sandwood Bay, Durness, Torrisdale Bay and Dunnet Sands are some of the best. There are dramatic cliffs at Cape Wrath, Dunnet Head and Duncansby Head to name a few. Sea inlets range from huge deep sea lochs in the west and north such as Loch Torridon, Loch Ewe and Loch Eriboll to the much gentler estuaries of the east including the Dornoch, Cromarty and Beauly firths, all of which are popular with breeding and migratory waterfowl and waders. The sheltered east coast also supports a more diverse flora. The 20th century saw major changes in some parts of the North Highlands, but most of the area escaped the blight of developers and town planners. Outside agencies, this time mostly of national or local government, tried various possibilities to develop the economy, but with only limited success. During World War 1 and World War 11 the Far North railway line carried many thousands of servicemen the 717 miles from London Euston to Thurso. They were travelling to Orkney, where Scapa Flow was the base of the Royal Navy’s Home Fleet in both wars. The Jellicoe train was named after a World War 1 British admiral and the journey time was at least 22 hours. The Dounreay Nuclear Power Development Establishment was built on a World War 11 airfield nine miles west of Thurso, starting in 1955. The site came on line in 1959 and was finally closed in 1994. The Fast Reactor plant was encased in the distinctive white dome which is to be retained. The site is currently being decommissioned, which will take at least until 2036, thereby continuing for the next twenty years, to employ a large number of highly skilled people and will thus remain an important part of the Caithness economy for decades to come. 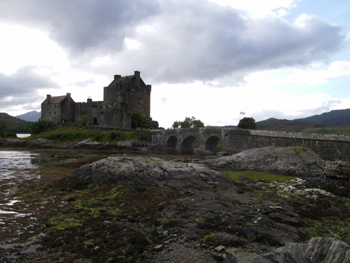 The Highlands and Islands Development Board (later to become Highlands and Islands Enterprise) was set up in 1965, to distribute grants for economic and cultural development. Initially grandiose plans were in favour but eventually it was realised that the North Highlands is unsuited to such developments and nowadays HIE concentrates on smaller scale projects which are more likely to succeed and be sustainable. One of the main long term benefits has been the investment in transport infrastructure north of Inverness. This has greatly improved access to Easter Ross and the Black Isle as well as the far north and west. Road improvements continue at a slower pace throughout the North Highlands, but sadly the main access roads from the south and east remain in serious need of major investment. Despite all of the many attempts to develop new industries in the North Highlands, the often derided primary industries – farming, fishing and tourism remain an integral part of the local economy. Scotland is the most mountainous country in the United Kingdom. The area north and west of the Highland Boundary Fault is known as the Highlands, and contains the country's main mountain ranges. The area includes Britain's highest peaks, especially Ben Nevis at over 4000 feet, with several similar peaks in the Cairngorms. Some of the most spectacular mountains occur in the northwest highlands, especially on Skye, the largest island off the coast. The Cuillin (also known as the Black Cuillin) is a range of rocky mountains, the highest point of which is Sgùrr Alasdair in the Black Cuillin at 992 m (3,255 ft). Cuillin is to distinguish it from the Red Cuilin (known locally as Red Hills) across Glen Sligachan. The Red Cuilin hills are lower. 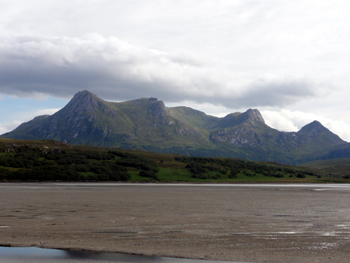 On the mainland nearby lie other ranges with Beinn Eighe (1,010m), Foinaven (911m) and Arkle (787m). 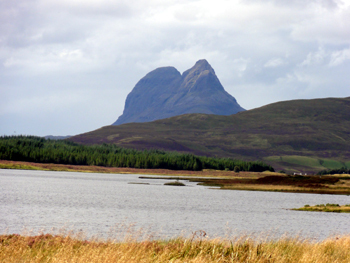 Further north lie other peaks such as An Teallach (meaning 'The Anvil' or 'The Forge' in Scottish Gaelic) near Ullapool (1,062 m, 3,484 ft) with Stac Polly (612m, 2,008feet) and Ben More Assynt (998m) in Sutherland. The Cairngorms feature the highest, coldest and snowiest plateaux in the British Isles and are home to five of the six highest mountains in Scotland: Ben Macdui, Braeriach, Cairn Toul, Sgor an Lochain Uaine and Cairn Gorm. Similar in size to Cyprus or Puerto Rico, Ross and Cromarty, Scotland, spans the country from the Atlantic on the west coast to the North Sea on the east. It contains some of the most beautiful parts of the country, with views of the islands and beaches on the rugged west coast, the mountains, lochs and waterfalls of the bleak interior and the old fishing villages of the east giving great scope to the landscape photographer. With a population of only 54,124 in 2013, an 8% increase from 2003, it is mainly rural in character, but has undergone some development in recent decades due to the oil boom. Older industries revolve around farming and fishing, and of course whisky distilling. The earliest Scottish distillery mentioned in official records was the Ferintosh, which is believed to have been located on the Black Isle in the east of the county. Sadly it no longer exists, but a number of distilleries can be found in the area. Ross and Cromarty has a surprisingly long documented history considering its rural character and remoteness. The Romans mentioned the natural harbour of the Cromarty Firth in their surveys, and Macbeth, King of Scotland in the 11th century, and much maligned by Shakespeare, held the title 'Thane of Cromarty', a man, often the chief of a clan, who held land from a Scottish king and ranked with an earl's son. Ancient religious buildings and ruins can be found in the county, from the early Christian settlement of St Maelrubha in Applecross on the west coast, to the cathedral of Fortrose on the east. Pictish stones, like the one in Nigg Old Church, can be found throughout the county. The chapel of St Duthus in Tain is where in 1306, Robert the Bruce's queen and daughter took sanctuary, only to be seized by the Earl of Ross and delivered to the English. Surprises in Ross and Cromarty include palm trees in the sub-tropical gardens of Inverewe on the Atlantic coast, warmed by the Gulf Stream, and the chance to watch Bottlenose dolphins in the Moray Firth. The county is not entirely rural in character, and Alness, its largest town has a thriving business sector. 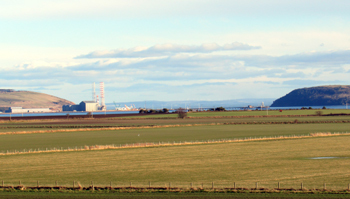 The Sutors of Cromarty are two opposing headlands which mark the entrance to the Cromarty Firth. The North Sutor rises to 147 metres (486 ft), while the South Sutor reaches 140 metres (463 ft). The Sutors stand guard over the firth, and many stories have been told about them. Sutor is the Scots word for shoemaker, and one story tells of two giant shoemakers, the sutors, who used the two cliffs as their workbenches, and tossed their tools to and fro between one another. Both North Sutor and South Sutor carry the remains of substantial military gun emplacements, coastal batteries built in the early 20th century to protect and defend the naval anchorage in the firth, which saw service during both World War I and, to a lesser degree, World War II, but was abandoned by the 1950’s. Built before the outbreak of World War I, this protection included elaborate defences to protect the firth from U-Boats, including not only the batteries, but a Boom Defence and Minefield, together with Lookout and Observation Posts, and Searchlight Batteries. Records show that both training and operation of the Sutor batteries were carried out by Norwegian personnel. From the Sutors the Firth extends inland in a westerly and then south-westerly direction for a distance of 19 miles (30.6 kilometres). 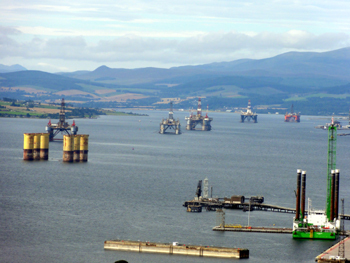 Between Nigg Bay and Cromarty Bay it is about 5 miles (8 kilometres) wide, at Alness Bay it is 2 miles (3.2 kilometres) wide, but it has an average width of 1 mile (1.6 kilometres). The southern shore of the Firth is formed by a peninsula known as the Black Isle. Good views of the Cromarty Firth are to be had from the Sutors or Cnoc Fyrish. At the head of the Firth is its principal river, the River Conon, other rivers include the Allt Graad, Peffery, Sgitheach, Averon and Balnagown. The Dingwall Canal remains connected to the Firth, although it is now disused. The principal settlements on its shores are Dingwall near the head, Cromarty near the mouth (from which the Firth takes its name), and Invergordon on the north shore. The villages of Evanton, Alness and Culbokie are nearby. 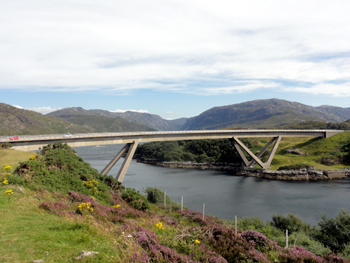 There is one bridge, the A9 road crossing between Ardullie and Findon. In the past there were several ferries across the firth (for example at Foulis) but now there is only one, a three-car ferry that runs between Cromarty and Nigg during the summer. History: The Firth forms one of the safest and most commodious anchorages in the north of Scotland and Invergordon was at one time a major base for the Royal Navy's Home Fleet. The Firth was the scene of the Invergordon Mutiny in 1931. Remnants of the Navy remain, such as the disused airfield near Evanton (now an industrial estate) which was built to take aircraft from the fleet carriers while they were at anchor. During World War II, there was a large training and operational base for Catalina amphibians and Sunderland seaplanes, which extended from Invergordon to Alness point - also now an industrial estate. A memorial to the men who were killed on operational missions was placed at this industrial estate in 2001. A propeller from a Catalina was found and restored by RAF apprentices and now resides in the town of Alness. The tennis courts on the industrial estate are the only remaining parts of the estate which date from World War II.